Proper kitchen design optimizes efficiency and makes life a lot easier for you. For most families, having an efficient kitchen is a necessity. It’s a functional space that your family takes advantage of on a nearly daily basis. From cooking dinner to working as a space for children to study, the kitchen is one of the most-used areas of the home. As a result, efficient kitchen design is a necessity so no one is stepping over each others toes. These four ideas are fantastic ways of prioritizing efficiency in your kitchen design. 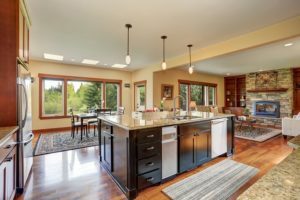 Being able to navigate your kitchen is essential for efficiency. This means that paths through the kitchen should be at least 36 inches wide so no one is bumping into one another. Additionally, paths within cooking zones should be between 42 and 48 inches wide. Always remember to follow this rule even when planning out kitchen islands. If you have children, you ought to keep cooktop areas out of the way of traffic so children don’t end up accidentally running into handles or knocking over pots and pans. It’s important to also remember that the refrigerator should be accessible to everyone in the household, not just whoever is doing the cooking. Keep in mind that corners can also be problematic—you’ll want cabinet and appliance doors to be free of any obstruction. For ideal kitchen design, think about how you use you will end up using your kitchen. For example, having your dishes stored close to your sink means you have to take less steps to put them away. Keeping all of your plastic containers together, and ideally next to the fridge, is a fantastic way of adding in another layer of efficiency. If you have children, you may want to include an accessible mini-fridge in your kitchen as well. This prevents them from accidentally getting in the way while you’re trying to cook but makes their snacks still accessible. This is a fantastic way to promote some independency among your children as well. This entry was posted on Saturday, April 7th, 2018 at 6:48 pm. Both comments and pings are currently closed.